COVER REVEAL!!! Then Sings My Soul, my sophomore novel! 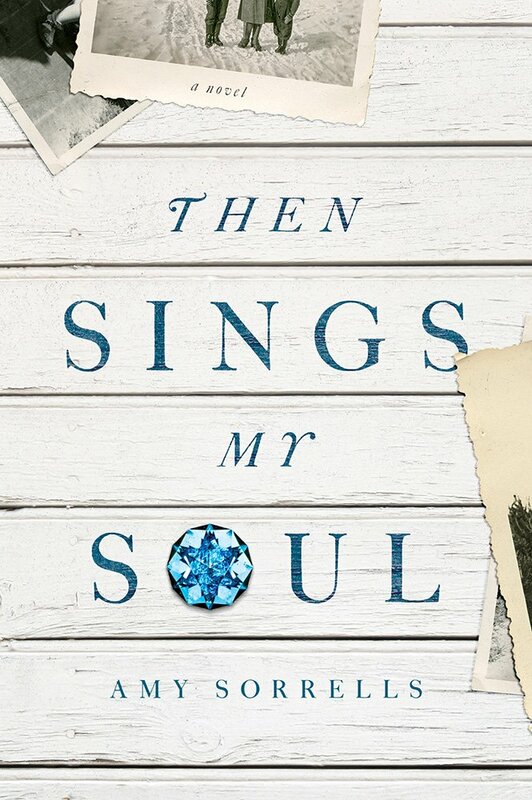 I’m BEYOND excited to share with you the cover of my second novel (coming March 1, 2015 from David C. Cook), Then Sings My Soul! In the coming weeks I’ll share more information about the history and inspiration behind this story. But there’s one amazing thing I want to share with you about the cover today. … including the one you see below. Yep. It’s something that the designers tell me rarely–if ever happen–in book designs, using something the author has on the cover. The incredible Cook designers came up with the cover draft, but they didn’t know where they were going to find an accurate and usable image of a blue stone (which is part of a bit of a mystery subplot in the book). I happened to be looking through my grandfather’s stones, and the very week the designers showed me this, I found this stone in his collection! This was one of his favorite designs, and if you’ll notice, the crown is shaped like the Star of David. Though this is not a story of my paternal ancestors, the plot was heavily influenced by their trek from Ukraine to America at the turn of the century. In the process of researching their journey, I discovered they were Jewish immigrants! They did not practice their faith once in America, but they were Ashkenazi Jews, just the same, a fact I find extremely moving and humbling. So, enjoy this cover and stay tuned as the release date nears for details. In the meantime, here’s a synopsis about the story. His Memory is Being Stolen…But God Never Forgets. With her father succumbing to dementia, Nel has little time to discover the decades-old secrets from his past that could forever alter both of their futures. When Nel Stewart returns home due to the sudden death of her mother, she realizes her beloved father, Jakob is struggling with the loss of his memory. With the reappearance of an old high-school sweetheart, deliveries from Ukraine, and the mysterious discovery of a vintage aquamarine gemstone, Nel senses God pulling her into the past to restore her and her father’s futures before it’s too late. Told partially through Jakob’s flashbacks of fleeing the Jewish genocides of eastern Europe at the turn of the 20th century, this novel reveals how even when mankind strips humans from their homeland and attempts to erase their faith – God will never leave his people. So excited, can’t wait to read it! Love, love, love! How awesome. Can’t wait to read it! What a gorgeous cover and the story sounds very intriguing! It looks wonderful! Can’t wait to read it. I love everything to do with Jewish history. The cover is beautiful and the book sounds wonderful. So excited for you and your writing life. This cover image is so rich in texture — intriguing and inviting.